My ankle continues to improve. Last week I managed another run walk session and then, I admit, I cheated on my plan and just ran on it the next day. I went out from work with a newish runner who was just looking for some company and we ran at talking pace for about 35 mins or 3 miles. I used it as an exercise in midfoot running and managed to keep my new technique all the way round. My calves were a bit stiff in the evening, but not unpleasantly so. I did my first boxercise session in a few weeks on Wednesday evening and got a great work out, though I was nervous of some of the jumping exercises. And then on Thursday morning I was back down the beach first thing for a tough PT session. We started with running drills, then worked our way up to a couple of exercises with 2 x12k kettlebells, using them as static weights and concentrating on my legs. I still wobbled a bit on some of the 1 legged exercises, so I still need to build up my balance and confidence in my left leg. But it was good to take things up a notch and challenge myself. By Friday, my ankle was a little stiff and achey, so I treated myself to a swim after work. I have been working on pull buoy drills and really feel they are making a difference, particularly in getting my elbows high and my hand into the water sooner. But for this session I just got in and swam, enjoying the feel of the water and it did the trick of easing the range of movement again. 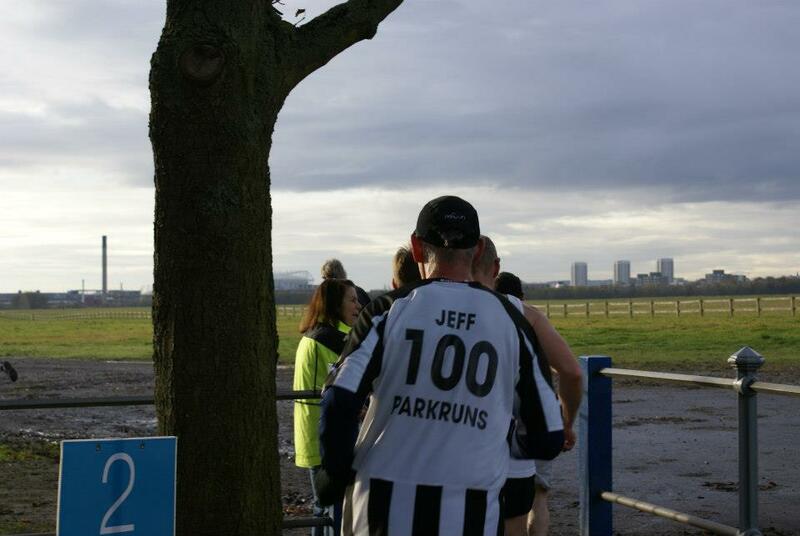 Saturday I layered up for a morning on the Town Moor, volunteering at Newcastle parkrun. I was dispatched to Gate 2, just after the 2k marker, so got a good walk there and back and a chance to see just how muddy and plodgy the paths are now. I managed to snap some pictures as well as directing runners through the gap. It was great to see Lesley Anne back running and smiling as she bounded along the tree lined road and to cheer Jeff on for his 100th Newcastle parkrun. Then it was a quick turn around to get home and out again for G and S Organics Bonfire night on the farm. We arrived early to lend a hand chopping and peeling vegetables for the soup, fetching and carrying things over to the outdoor events area and stringing up fairy lights. 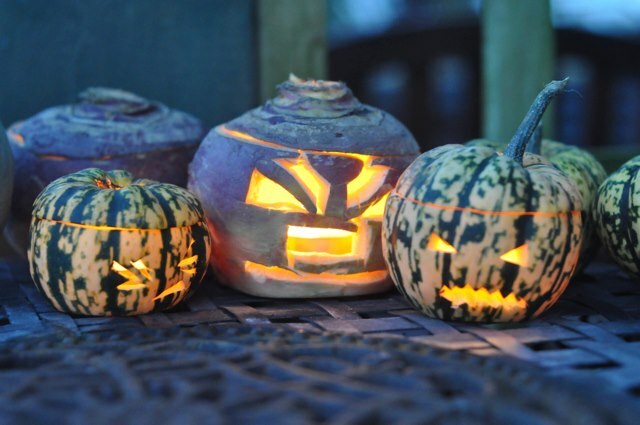 There was a great display of carved pumpkins, turnips and little squashes and by the time the other guests arrived it was growing nicely dark, so we were glad of the heat of the bonfire and a few sparklers. No fireworks because of the animals, but that suits me just fine. The food was, as always, delicious. Soup and burgers when everyone arrived, then after a bit of bonfire chat, a plate full of pheasant au vin and leeky mash with three different types of cake for pudding. As the evening drew on we looked up at the clear skies to see millions of stars. No sign of the Northern lights, but you could see the Milky Way. Steeped in woodsmoke, we drank cocoa as we cleared up and made our way home. It was a splendid way to spend the day. lovely weekend, spent largely outdoors, enjoying the autumn sunshine. We went up to Christmas Farm on Saturday for one of the G and S Organics event days. Lee and Beth had baked and cooked up a feast ready to welcome everyone. We helped prepare, setting out tables and hay bales for seats, finding cutlery, washing cups and glasses and generally getting everything set. The focus for this event was on game, so there was a dog display with some lovely spaniels demonstrating search and retrieve and a wire haired terrier that showed off his pointing skills. There was also a chance to do some clay pigeon shooting, which I’d tried for the first time at this event last year and really enjoyed. The instructor was very good, calming, patient and made you feel very safe, despite holding a shotgun. I think the clays were set very easy to give us a good chance, as I hit most of mine. Although I missed the last two when he said I was sure to get them! We caught up with friends and talked about food, wine and travelling. As the evening drew in, we watched the sunset over the hills and warmed ourselves with baked potatoes cooked in the fire and a fantastic beef stew. As the stars came out, the talk continued around the fire, until, drenched in woodsmoke, we drove home to a hot bath and comfy bed. On Sunday, I woke to sunshine, and met my friends Penny and Sue for a nice leisurely bike ride along the Tyne. Fine, flat cycleways, a river sparkling under the blue skies, no pressure for miles and pace, just a social ride with friends who are so easy to get on with. Sorry, I’m a bit behind on my blogging and just catching up with last weekend before i enter into the business that will be this one. Brrrrr, it was a tad nippy on the Town Moor on Saturday and I was glad of my multiple layers from thermals upwards as I volunteered at Newcastle parkrun. I’d hoped to run it, but in a bid to keep my pace sensible, had offered my services as a pacer, only to be told they had a full set. So I was on registration duties, ready with my barcode scanner. It meant I had a bit of time to chat before the start and it was nice to be approached by a couple of new people wondering what to do and how it all worked. As always with Newcastle parkrun, you think there’s hardly anyone there and then just a few minutes before the start, you realise runners have been arriving from all directions and there’s quite a crowd. Soon the runners were away over the silver green grass, a multicoloured stream tracking across the moor. The first finishers were quickly through and then it was busy time, scanning barcodes and numbers and occasionally looking up to see a queue of runners patiently waiting to record their results. I recognised names, but barely saw any faces as my chilly fingers wrestled barcode, number and scanner. A chorus of thank yous and some very cheery runners who promised they had a PB if only it would scan properly kept me smiling. I didn’t have time to miss running it, but as the tokens kept coming it looked like we were on for a record turn out and as Fred the tail runner came in, we were up to 366 a very keen turn out on such a cold and frosty morning. So, back home and de-layered, into another set of kit that would see me drop off something to be mended, take my mountain bike for its service and then allow me to head off for a run. Tasks done, I jogged back home, ditching my cycle helmet and jacket in the hallway, changing the settings on my Garmin and heading out for a run. My foot’s still playing up a bit, so slow and steady is the aim. And I’ve realised I need to rethink my definition of slow. Slow is not the pace I ran my best half marathon at, not even over a shorter distance. Slow needs to be slower than that. I need to ditch my speed thinking and just do what I can at the moment. Anyway, I ran a couple of loops locally, giving myself the option of ducking out if I felt anything not right in my foot. It was mainly road, but took in a bit of beach and playing fields too. It was nice just to have the freedom to get out and run and not know how many miles I’d done until I heard the beep of the Garmin. In the end I managed just over 5 miles and wouldn’t you know it, only started to feel a stiffness in my foot when I was at about the furthest point of my loop, meaning I had to run just over a mile to get home. But I relaxed and tried to remember the form advice, trying not to push off with my toes and keeping my knees bent and I made it without any trouble. Stretches and ice straight away when I got in and it’s okay. On Sunday I tried out a new workout on my plan. You know me, I love a plan. And with needing to be mindful of my foot, but wanting to burn off some of the Christmas excess, Ian’s come up with some interesting variations. I tried some indoor tri cross training with a sort of brick session between the rowing machine and spin bike. It was pretty tough and I was glad I had some power tunes on my iPod to help me power through the bike section. I’m really not fond of static biking except in a spin class, so I used the music to do some intervals, faster and slower to reach 15km in just under 30 mins. And actually I got a great buzz from doing it. I cooled down with a bit of a swim. I don’t really have a plan for swimming, but I’d like to improve my 400 and 500m swim time so, after some advice on fetcheveryone.com I swam 4x100m off 2:20 and was amazed that I was swimming 100m in less than 2 mins. A few more focused interval sets and hopefully I’ll be shaving some time off my longer swims ready for sprint tri season. 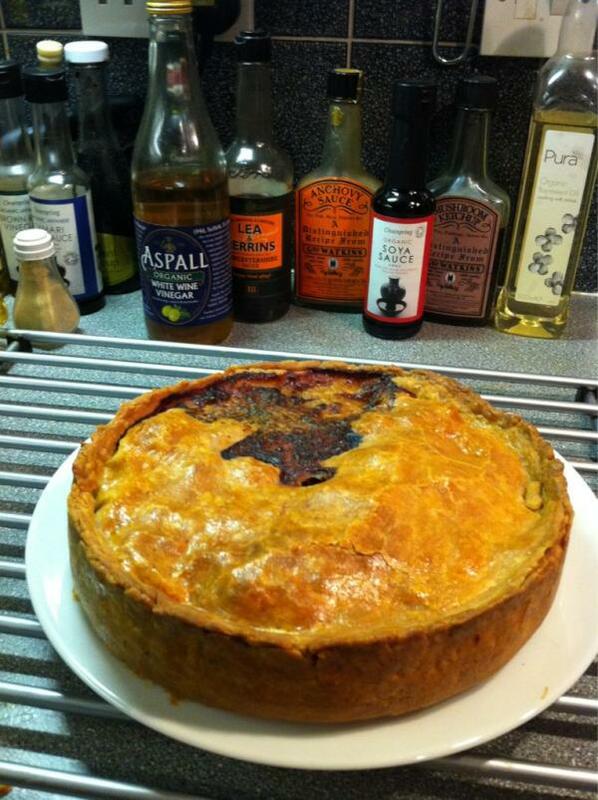 And after all that exercise, I made my first ever pork pie, courtesy of a recipe and ingredients from our friends at G&S Organics. I’m rather proud of how it turned out. There’s a keen batch of runners where I work. Most of them faster and more experienced than me. But they’re a good bunch and really supportive. Every month throughout the summer, the managers of the onsite gym have organised a 1 mile handicap race for us to compete in and this week was the last race of the season. I ran the first one not long after my storming Fetch mile, and have never quite managed to match that performance. The handicap system means that normally me and a girl called Jill are the first to set off, with the rest coming at intervals behind us. We inevitably get overtaken by the faster runners towards the end. There were, I think, 6 races, with the top 5 performances to count. And you got points based on your placing in the race, rather than your time. The idea being that the handicap system should see us all finishing around the same time. My tactics for the series were just to turn up to as many as I could make and see how I got on. And if I could score first female, so much the better, especially as I knew my friend Kathryn wouldn’t be running many as she’s been injured. I made all but one of the races. And I actually won the August race as there was a grand field of two competitors and my follower set off a good way behind me. I hadn’t looked at the results for the September race which was the one I missed, but someone mentioned I was near the top of the leaderboard. All I knew was that this time I was handicapped 30 seconds behind Jill, so I set off with the goal of trying to catch her by the end. I sprinted off way too fast to try and make up some of the distance and quickly got in a mess with my breathing. So I eased back and just resolved to run steady, trying to stretch out my legs. I felt uncomfortable, tight chested with the remnants of a sore throat and flat footed in my new trainers. But it was a gorgeous day for a run. Bright, not too cold and barely a breath of wind – a rare occurrence for this stretch. At the turn onto the home straight I could see Jill in the distance and just determined to try and break that down to something less than 30 seconds and then when I got to the final corner push into a sprint. Along the back straight, I could hear one of the speedy male runners approaching. I made him work for his overtake, grinding out a little more speed and trying to hang onto him as I approached the final turn. I’d narrowed the gap to Jill quite a bit, but I knew she’d give it a good kick in the last couple of hundred metres too. Around the last corner and up through my gears again, conscious that more runners were fast approaching and determined not to be overtaken. Head down, arms pumping, really powering through my legs. This was hurting, but there was still more to go. Jill was kicking on too, sensing me coming closer. Push on all the way to the finish and just about clip her heels on the line. We finish less than a second apart. And I’m gone. Desperately fighting for breath. Head down, gasping in air. I actually feel a bit wobbly and have to put my hands on the damp tarmac to steady myself wondering if I really do feel sick. I crouch down trying to get myself back together. I have no idea who else crosses the line and in what sequence. Gradually I begin to settle and I look at my watch – 7.10 you beauty! That’s a new PB for a mile. It may only be a second off my Fetch Mile time, but a PB is a PB and it’s my best time for this course by far. I think I’ve placed third and scored some more valuable points. As we walk and jog back to the office, Jill says she thinks I’ve won the series. I know I’ll be the top placed female as only Jill and I have run enough races to count, even though there are much faster runners than we are. I await the official results with high anticipation. It’s all about tyres. I took my car for its MOT a couple of weeks ago and it cost me two new tyres and some other bits and bobs. Gary’scar has just developed a flat and he needed to be in Northumberland to help our friends prepare for a harvest supper at the farm. So we had an early start on Saturday, with me dropping him off in Longframlington and then making my way back to Newcastle for parkrun. Gary laughs at me when I set out all my running or training gear the night before, but I was ready to go and he had a last minute ‘where are my keys?’ moment. So consequently we were on the road a little later than I’d have liked. It was still possible to make it, but it was going to be tight. No luxury of a chat and a warm up. As I dove into the car park and threw my money into the machine, the timer ticked over 09:00am. Oh no – I was going to be late. I ran up the hill and through the gate to see the parkrunners taking off into the distance. I didn’t really think. I just hit go on the Garmin and started to chase them. It was a bit depressing at first being so far behind, but as I started to reel in the backmarker marshall, I thought to myself, let’s pretend to be Sonia O’Sullivan on the Great North Run and see how many I can overtake. I was flying by now, and probably going a bit too fast, overexhuberant after an unexpected start. As I turned into the gate back onto the moor, it took me a second to realise that Dave was being the gentleman and holding it open. I’d passed the 2k marker, but my Garmin didn’t beep until some point afterwards. And of course I realised, I’d run a short course. So what to do? I knew no one would notice. I knew I wasn’t on for a PB or anything close, but I also knew that I would know if I ran short. I was continuing to have fun chasing down runners ahead and trying to keep to my pace. Although I’m sure it was a bit demoralising to some as I went past. I hope I managed to spur some on. At the gate just after the 4k marker I shouted to the marshall that I’d run a short course so would do a couple of turns to make up the distance. Keeping out of the way of the runners coming through I turned and ran back to make up the estimated 200m I figured I was short. Another turn and my Garmin beeped just as I hit the 4k marker. Spot on, I was back on track and heading for the finish. It was another one of those, ‘have I got the legs for a sprint at the finish?’ moments. But having been chasing runners all race, I was like a dog with a stick. I focused on a few ahead and thought I’d see how many I could pass before the line and raced through to applause from birthday boy Jeff (already finished in a stonking time). My time for my 5k 25:57 – not too shabby but a personal worst on this course and my official time would be a good bit slower. But never mind. It was a great day for a run and there was a fab Fetchie turn out. It was lovely to be able to wish Jeff a richly deserved happy birthday and pose for a photo at the end. Dave, Lesley, Steve and I went off to scope out possibilities for the Town Moor marathon Fetchpoint. I had high hopes for the steps of the museum, but the shape of the building means the runners really are on top of you before you know it. The bandstand promises to be breezy, but it will at least keep us and any goodies dry and gives us approximately 15 seconds warning of Fetchies approaching. I’m sure we’ll work it all out on the day. Gary borrowed my car again today to help our friends tidy up after last night’s harvest supper and bonfire at Christmas Farm. We had a lovely evening watching the stars, warming cold hands on the bonfire and tucking into some great home grown grub to celebrate the completion of the shed. Our friends Lee and Beth have worked so hard over the past two years to turn a 30 acre patch of marshy land into a viable organic farm that supports their box scheme business. It was great to see so many people there celebrating a special moment in the farming year and catching a glimpse of the turkeys, geese, cows, sheep and pigs that may one day make it onto their dinner table. My plan was to get out on my bike for a decent ride and to get more confident about riding it. I also wanted to try out the pool where I’ll be swimming my aquathlon next weekend. So I plotted a route on my local cycle map that would take me there, using mainly off road tracks and part of the national cycle network. I knew how to get to the start of the path, so off I set, feeling a lot more confident than last week. But I was still glad of a breather by the first set of traffic lights and although I braved a right turn at the first roundabout, I hopped off to walk my bike straight on at the major junction. Soon I was off and away along the long straight paths of the waggonways and cycle network. It was a great day for a ride and I found myself grinning as I passed walkers, runners and other cyclists enjoying the autumn air. I was taking it relatively easy as I wanted to save some energy for a swim and the return journey, but I was pleased to find myself progressing up through the gears and vowed not to free wheel too much but to keep the legs ticking over. As I turned away from the cycle route in a nearby village I stopped to check my progess on the map and a couple of cyclists asked if I needed any help. But I’d worked out I was on the right route, so I hopped back on thinking not far to go and working out the next sequence of turns. Unfortunately my confidence in my navigation skills was somewhat misplaced as soon afterwards I took a turn too soon and went off track. I realised what I’d done pretty quickly, but consulting the map saw another way to get back on track. But I was foxed by a large road junction, which although well set up for cyclists with crossings and signposted cycle paths, I couldn’t work out which road I needed to take. I’d been cycling for 45 minutes by now and was beginning to think maybe my plans were a bit ambitious. I decided to back track, but then got myself confused trying to find the road I’d come from. Luckily I had a fair idea of where I was, so I opted for a direction I knew and decided it was time to head back home. Navigating by following tracks parallel to major roads and local signposts took me through some muddy spots and I had great fun bouncing around on my mountain bike tyres. It was like being a kid again, exploring the area where I lived on my bike, finding ponds full of reeds and fields full of tall grass. The scary bit was when my path brought me out into a generic housing estate, and I only had a rough idea of where I was. The danger here was getting lost in the maze of little streets with near identical houses. I tried to pick the main roads and headed roughly in the direction I wanted to go. I’ve never been so grateful to see the logos of a retail park that told me I was on the right track. Back on the home stretch and a good downhill home towards the sea. I let myself off with the most straightforward route, powering through the pedals and enjoying the fresh air on my face. I felt like I could have kept going forever. But even without the swim, I was hungry and aware it was approaching lunchtime. So home with my muddy bike and keen to explore again another day. 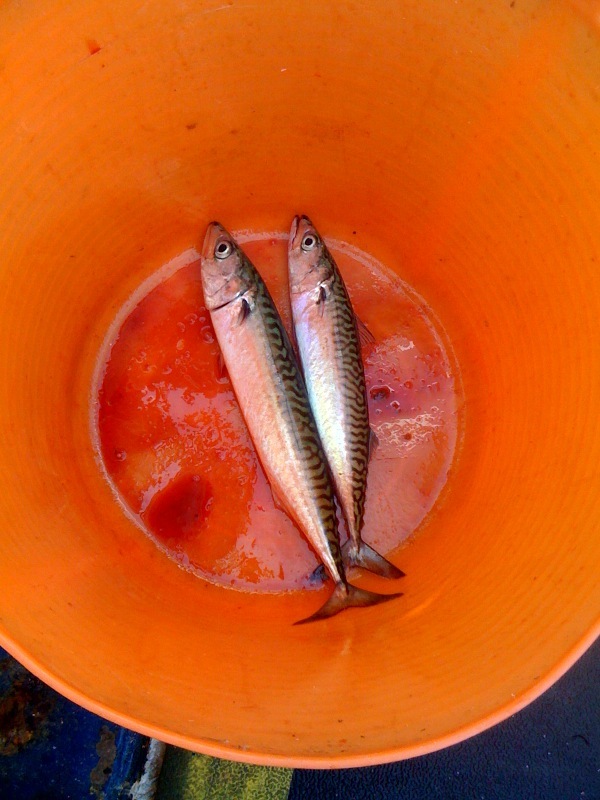 It couldn’t have been a better evening for my first ever fishing trip, organised by Lee and Beth of G&S Organics. 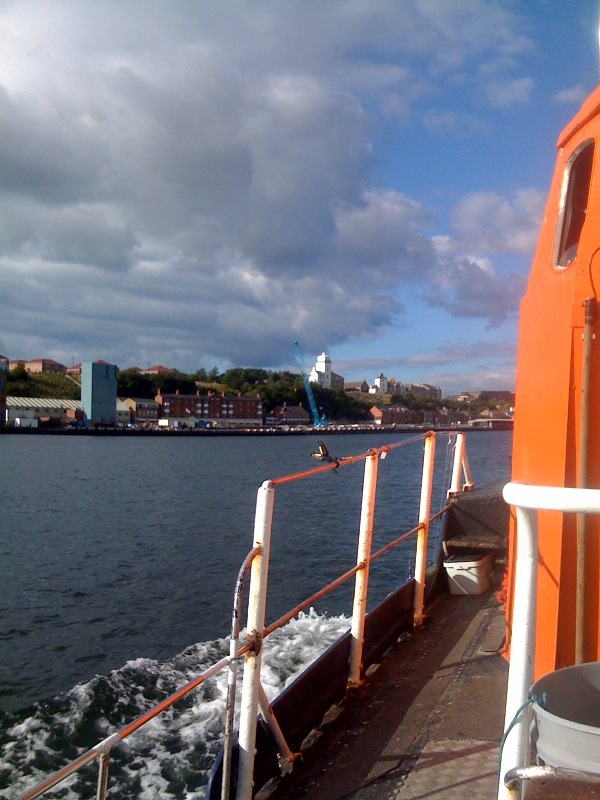 Eight of us motored out from North Shields under balmy summer skies onto smooth waters, taking photos of familiar coastal landmarks from a new perspective. Out beyond the breakwater and the piers marking the mouth of the river, feeling the gentle pull of the sea. At some unidentifiable point, still in sight of the coast, our crew powered down the engines and turned their attention to showing this fishing novice how to work the rod and reel. My usual mechanical ineptness found me getting twisted up in someone elses line and getting my own rather tangled in my first couple of attempts, but the guys were on hand to sort me out and start me fishing. It’s not long before one of the gang scores the first catch as Neil reels in a fine couple of mackerel. Their green and silver scales gleam in the bottom of the bucket. At first I find it hard to tell the difference between the pull on the line of the lead weight and a genuine bite, and on a speculative reel in, find I’ve caught my first fish. Sadly they’re coalfish, small and not great for eating, so they go back in. Around the boat everyone’s reeling in mackerel and it’s not long before I land my first genuine catch. I rely on a trusty helping hand to unhook them from my line, but soon I’m catching two or three at a time. These are beautiful, slippery creatures that wriggle wildly, red gills flailing as we drop them in the rapdly filling buckets and haul our lines over the side for another try. As the catch begins to slow, we move on to another spot and Lee and Beth prepare our onboard feast. Cool boxes unveil bread, cheese, salad leaves, tomatoes, herbs and dressings as Lee gets to work chopping up a salad. 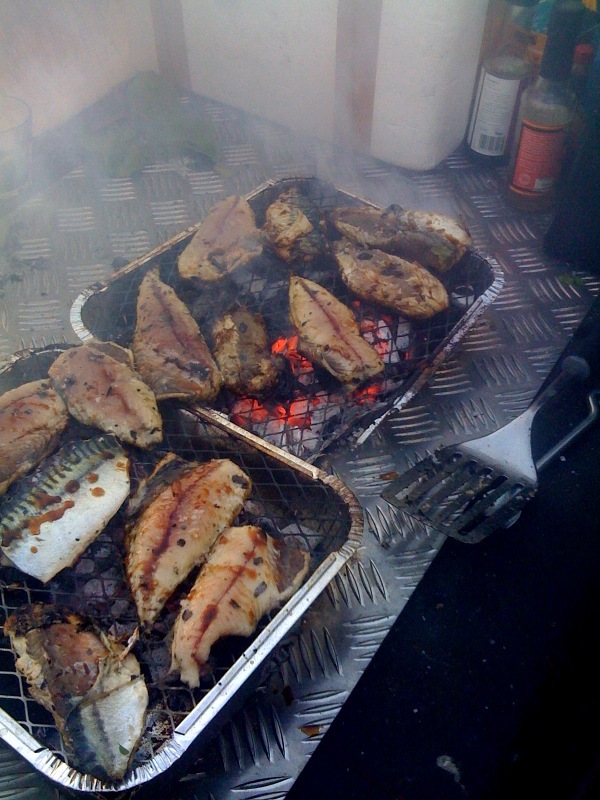 Soon fresh fillets are sizzling on the disposable barbecues. It’s an informal picnic, but when fish is this fresh it needs nothing more fancy. We’re soon licking fingers and lips, tasting the sweet, salty, delicious catch. All too soon we’re stuffed and return to re-stock the buckets. This time I take on landing duty, unhooking the fish as Gary reels them in. The first one escapes my clutches and slithers around the deck, comedy style until I get the knack of a firm grip on its slippery scales. Soon I’m unhooking and filling the buckets with relative ease, oblivious to the slightly messy process that leaves my hands covered in tiny transluscent scales that glisten like salty sequins. By now the boat’s surrounded by a bevy of gulls. Martin, from Northern Experience Wildlife Tours helps us identify herring gulls, fulmars and a couple of gannets both on the water and in the air. As the sun starts to set, we raise our rods for the last time and head back towards the mouth of the river. 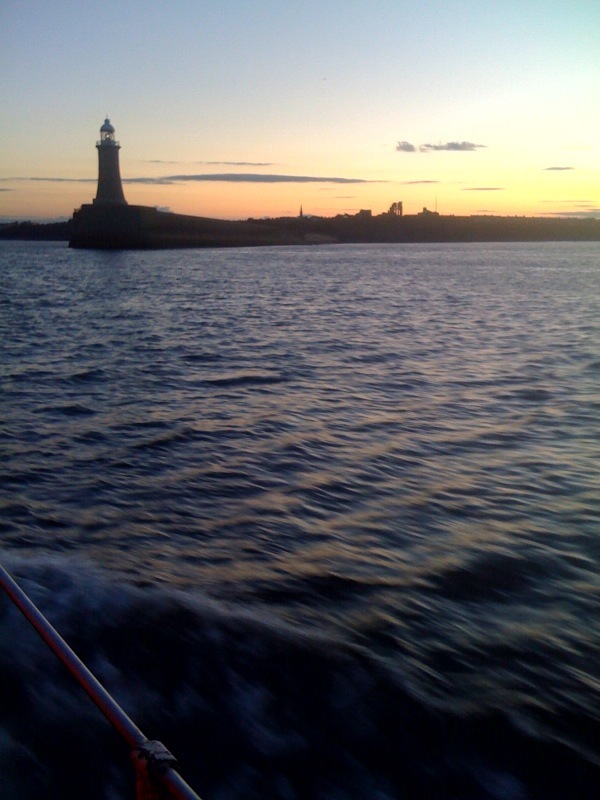 We land our catch, transferring a fine haul of line-caught mackerel into cool boxes and re-discover our land legs after a fine evening fishing and feasting on the Tyne.